When you're in the midst of your bathroom design project, you're probably looking to improve the aesthetics of the space, but its utility should also be at the top of your list. 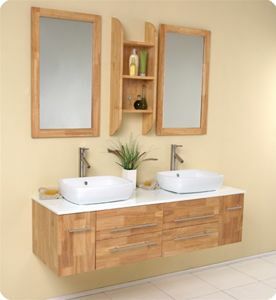 If you and your significant other have similar schedules, finding a dual sink bathroom vanity could help you get out of the house much earlier in the morning. There are countless options to choose from when shopping for a bathroom vanity, but if you really want to put your personal stamp on your washroom, why not create a his and hers arrangement of vessel sinks? This can allow you to choose sinks that speak to your design tastes and they can be switched out later down the line if you have a change of heart. On the other hand, if you have a combination of drop-in sinks, you can use your mirrors as a means of expressing your personality. You can use a combination of designs or go with a matching duo to create a streamlined arrangement. A dual-sink vanity is a wise choice in any home, and it could improve the overall utility of your bathroom for years to come.